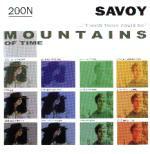 Savoy's third album "Mountains Of Time" was released in Norway on 23rd August '99 and in Sweden on 15th November 1999 (regular edition only). In addition to the regular CD release there was also a limited `boxed' edition which contains the CD album plus a bonus 5 track CD. This 12 track album features was written and produced by Lauren and Paul Waaktaar Savoy. The album was mixed by Ulf W.O. Holand at Lydlab Studios, Oslo (tracks 2,3,6,8,9,11 and 12) and by Jason Corsaro at Sorcerer Sound, NYC (tracks 1,4,5,7 and 10) and was mastered by Vlado Meller at Sony Studios, NYC. It features the additional musicians: Bjørg Vørnes, Henning Båtnes, Elise Båtnes, Andre Orvik, Frode Larsen, Harvey de Souza, Sølve Sigerland, Berit Værnes and Atle Sponberg on strings (tracks 1,3,8 and 12); Lasse Rossing on trumpet (tracks 1 and 3); Jørun Bøgeberg on bass (tracks 2 and 3); Sven Lindvall on bass (track 1); Per Lindvall on drums (track 1); Magne Furuholmen on Clavicord (track 6) and Preben Grieg-Halvorsen on keyboard and programming (tracks 4, 7 and 12). All strings and brass scores by Paul Waaktaar-Savoy. Lauren Savoy designed the cover of the album. The front of the regular release is white with twelve coloured shots of Lauren and Paul arranged in columns of three in the bottom section of the sleeve. The first two columns feature a picture of Lauren, printed respectively in grey and blue-tones. The third and fourth columns feature a picture of Paul, printed respectively in green and orange-tones. In addition, there is a light grey box printed above the first column of Lauren pictures. The Savoy logo is printed in black in the top right hand corner with the text ..."I wish there could be" and the album title (in grey and dark green letters respectively) underneath. The tracks are printed in small letters above the coloured boxes, each one is given a 4 digit code starting y2 and followed by the track number (like the Pantone colour system). The last track, "Tongue Tied", is spelt incorrectly on the sleeve as "Tounge Tied". The reverse of the 6 page booklet features a picture of Paul sitting in front of some trees and a mountain. Outlines of tweleve boxes, arranged in the same manner as on the cover of the booklet have been printed over the bottom part of the picture. Inside the booklet there are two more purple-tone shots of Paul and Lauren, a colour shot of the band (centre pages), a scenic shot of the mountains plus the lyrics which have been printed in white text on dark blue and dark green pages. The box outlines have been used throughout the booklet, always printed in the bottom section of the page. The back insert of the album is of similar design to the front but the colours used are tones of grey, green and purple. The first two columns feature a picture of Frode, printed in different tones, where as the last two columns are left blank. The tracks are printed above the boxes in a similar way to the front (spelling mistake still intact). The tray of the jewel case is clear, through which you can see a picture of Lauren, photographed in a similar location to the picture of Paul found on the reverse of the booklet. Next to the picture are blue outlines of 3 rectangles which can be seen even when the case is closed. The CD itself is a green / grey colour with silver titles. In addition there are some silver outlined boxes down the left hand side. The limited version of the album comes in a double slim-line jewel case which itself is slotted inside a cardboard sleeve. The design on the front of this sleeve is similar to the sleeve of the regular edition but each toned photo is replaced by a blank coloured box. The design of the reverse of the card sleeve is similar to that of the reverse of the album but again the pictures have been replaced by blank coloured boxes. Also, the information and tracks refer to the bonus CD, rather than the album and the number in the top left hand corner is "300N" rather than "200N". 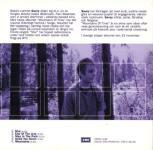 The album booklet is identical to the regular release, except for the picture on the reverse which is a purple-tone close up shot of Paul taken in the woods. Again, the twelve box outlines have been placed over the bottom section of the picture. The disc is identical to that of the regular release, even down to the catalogue number printed on it. The reverse insert of the jewel case is almost identical to that of the regular release, but the correct catalogue number has been printed alongside the barcode. This bonus CD is housed in the double jewel case with the album. The track listing for this album can be found on the insert underneath the double CD tray. This insert features a purple-tone picture of Lauren in the woods (this is in place of the Lauren picture which is printed under the disc tray in the regular release). Again the outlines of boxes are present along the bottom section of the picture. Titles are printed in white along the centre of the sleeve. Next to the picture there are 3 grey outlines of rectangles and the text "Bonus CD The Bovarnick Twins" which can also been seen when the case is closed. The CD is similar to the album disc but is light purple instead of green / grey. The discs are regular CD-Rs (MITSUI editions exist), some of which have been written on by hand. Another EMI inhouse promo has an identical track list to the final release, although track 5 is listed as "When They Grind You Down" and track 9 as "Everyone Can Say They're Sorry". Recorded on a Kodak CD-R GOLD edition, this disc has a white top with "Savoy Mountains Of Time" plus track list printed in black. The red EMI logo is printed on the right side of the disc with "Promotion only. Not for sale. Release 23.08.1999" printed on the left. A master reference CD of the album's bonus disc "The Bovarnick Twins" was produced by Master Huset AS. It comes in a generic Master Huset AS simple folded inlay which is white with purple and pink printed text. Details of the Savoy release have been handwritten on. The disc is a plain white CD-R with the title handwritten. The tracks found on the bonus disc are the same as on the regular release. There was also a 5-track EMI inhouse promo sampler CD-R. Savoy "Mountains Of Time", track listing plus release date are printed in white text on the front of the otherwise black sleeve.The reverse of the sleeve is plain black except for the text "EMI 02.07.1999 EMI NORSK A/S" printed in white at the bottom. This CD-R hasn't been given a catalogue number. Another 5-track promo sample CD was available in Sweden. The front cover is similar to the regular album release, but "album sampler" has been printed underneath the title. 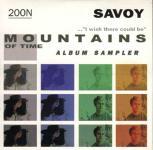 "Mountains Of Time" was released in Germany on 20th November 2000. It is packaged identically to the Norwegian release, but features a red sticker on the front which reads ""a-ha - songwriter and guitarist Paul Waaktaar-Savoy - www.savoywebsite.com". To coincide with the German release (?? ), there was a VIP promo acetate "Very Important Products 30.10.2000" advertising Savoy's album and releases by other artists. It features 3 tracks by Savoy (tracks 3-5) and tracks by other artists including Kraftwerk and Anneli Drecker (total of 18 tracks). The cover includes a picture of the album "Mountains of Time" with "VIP 44.KW Very Important Products 30.10.2000" printed above on a dark grey background. The reverse features the track listing printed over the top of a faded logo of the dog looking into a gramophone. VIP is printed in large black letters in the top right hand corner. The disc is plain without any text.